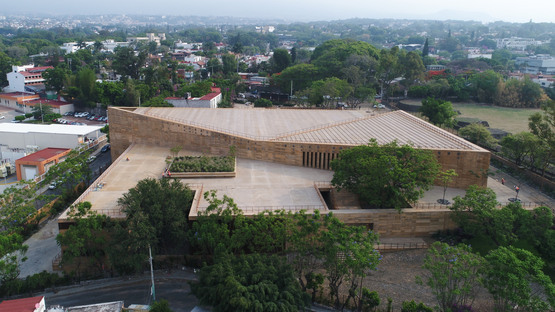 Cuernavaca, in the Mexican state of Morelos, has a new cultural centre. The iconic building designed by architect Isaac Broid and the Productora studio, both from Mexico City, merges the past and the present of the country through simple geometries with a great impact. 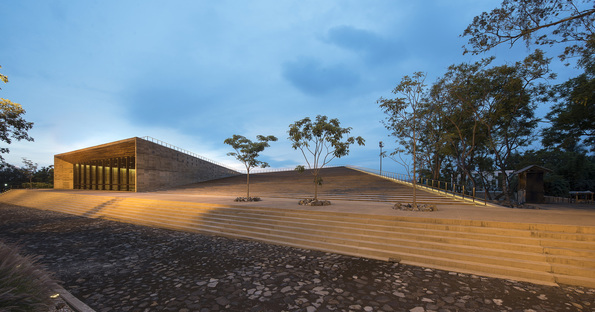 An important building located in a place with a great historical and cultural value: the new Teopanzolco Cultural Centre, designed by the Isaac Broid and Productora,Studios, was built close to an archaeological area in the state of Morelos, in the centre-south of Mexico and, more precisely, on a slightly sloped land in the city of Cuernavaca. Its peculiar location proposed two design strategies: on the one hand to enhance the relationship with the pre-colonial archaeological site and, on the other, to generate a significant public space. This way, Isaac Broid and Productora organised the architecture around two elements, a triangular building that contains the public areas (lobbies, services, box offices, cloakrooms, and an auditorium with 900 seats) and the platform surrounding it and hosting the operation areas (dressing rooms, warehouses, workshops, etc.) and a multi-purpose, black box theatre. The horizontal platform surrounding the triangular building contains a series of gardens incorporating the large existing trees. It also is an amazing viewpoint, allowing to contemplate both the archaeological area and the city. In particular, one patio was sunk into the ground to create an outdoor theatre. The main triangular-shaped roof of the auditorium is a large stepped ramp, that emerges from the intersection with the horizontal platform. 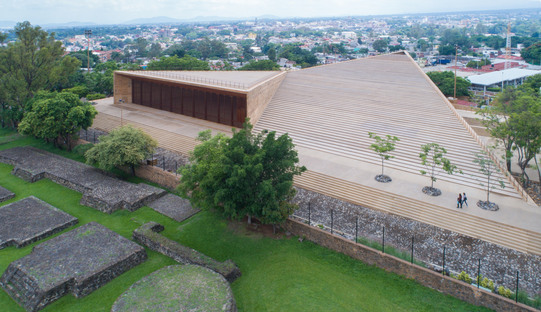 This solution substantially reduces the physical presence and visual impact of this new Centre and converts the roof into an additional open-air auditorium, which has the archaeological site as a backdrop. It is mainly made in natural stone, a material chosen to make a clear reference to the archaeological site itself. The architects created a visual interplay of inclined planes descending in opposite directions: one of these is the small and flat triangular area covering the main hall, a semi-open space with strategically located windows permitting cross-ventilation and avoiding the use of electrical air conditioning systems. 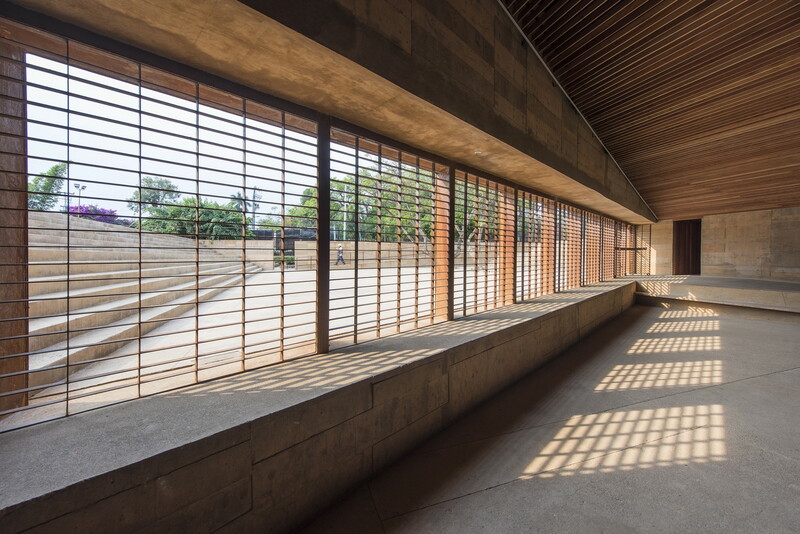 Moreover, the axis of the triangular floor plan of the hall was deliberately aligned with the main pyramid of the archaeological site, creating constant references to the contemporary cultural life and the presence of the past. 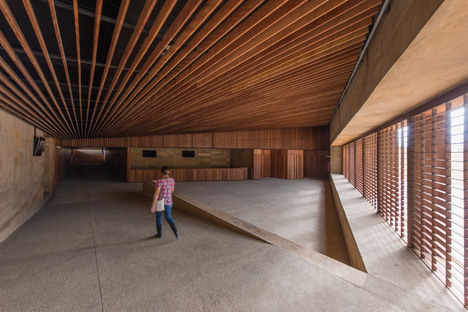 The new Teopanzolco cultural centre, designed by the Isaac Broid and Productora studios, therefore, is the tangible expression of a harmonious dialogue between the past and the present, thanks to a design that respects both the context of the building and the history of its location.